Thanks to the help of three boat crews and a dive team, our Folger Pinnacle instrument platform is now reinstalled on a submerged reef in Folger Passage , ready to be reconnected to the network. The installation took several days to complete and required teams and equipment from several different partner companies, including Pelagic Technologies , Ocean Dynamics Canada  (ODC) and the Bamfield Marine Sciences Centre  (BMSC). First, the platform was transported via flatbed truck to Port Alberni, loaded onto the M/V Francis Barkley , and shipped to Bamfield Marine Science Centre, our base of operations for the installation project. NEPTUNE Canada's Jonathan Zand, Reece Hasanen and Alice Bui drove to Bamfield to prepare for the next day's installation.Then, on the second day, the crane barge Harbour Clearwater arrived to load the platform and associated deployment equipment. Part of our crew boarded the barge, while the dive crew set up shop aboard BMSC's M/V Barkley Star. Both vessels made their way to Folger Pinnacle, a short sail from Bamfield, and worked together to deploy the instrument platform. The platform was lifted by crane over the side and into the water next to the barge. Then the divers attached large inflatable bags to the platform and filled them with air to provide floatation. Once it became neutrally buoyant, the platform was released from the crane and the dive crew dove with it, carefully guiding it down onto our platform frame on Folger Pinnacle (depth 25 m). The divers then bolted the platform onto the base frame and positioned the 3D Grasshopper camera array to focus on a particular yellow sponge, which will be the subject of intense scientific study over the coming months. 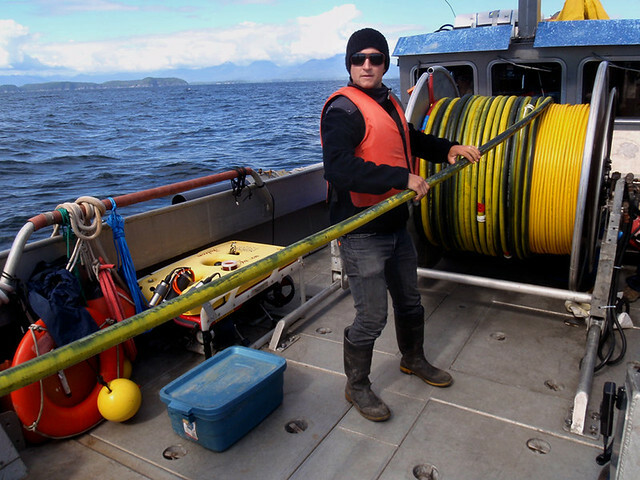 While this was going on, NEPTUNE Canada's Martin Scherwath and Justin Napier hauled the new electro-optical connecting cable from Victoria to Port Alberni. At Port Alberni, they were greeted by the Captain and crew of the M/V Crown Royal (operated by ODC), who helped spool the cable onto a drum mounted on that boat. The Crown Royal sailed to Bamfield via Alberni Inlet, while Martin and Justin drove the long and winding road to Bamfield. The next day's task was to lay the cable from Folger Pinnacle instrument platform to Folger Passage node. For this work, ODC's M/V Crown Royal and their mini remotely operated vehicle (ROV), the Seaeye Falcon, were instrumental. First they lowered the cable end, with attached connection plug and termination canister, to the rocky pinnacle below. The dive team secured the cable with heavy chains. Then the cable was slowly spooled out as the Crown Royal navigated to Folger Passage node. Folger Pinnacle reaches up into relatively shallow waters, accessible to professional divers. But Folger Passage node is installed 600 m away at a depth of 100 m—too deep for diving. This is where the Falcon ROV came in, deployed from the Crown Royal to inspect the cable lay in deeper waters. 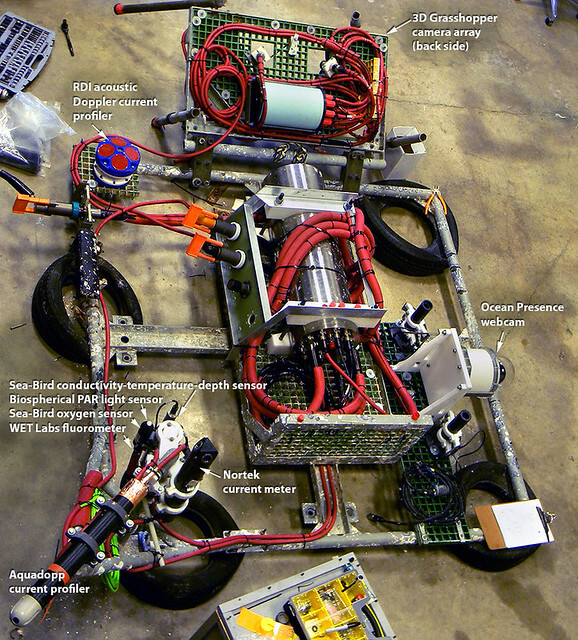 Finally, the node end of the cable, with its attached connection plug and termination canister, was carefully winched to the seafloor next to Folger Node. The following day, the divers plugged in the cable end to Folger Pinnacle instrument platform and further work was done to secure and survey the cable. The disconnected end of the cable will rest on the seabed next to Folger Passage node until our next cruise, when a larger ROV such as ROPOS can be launched to plug it in, allowing power and communications to flow. The timing of this connection is not set as yet, but we hope to accomplish it as quickly as possible, so scientists can begin using the new instruments there. Many thanks to Pelagic Technologies  dive team (Glenn Hafey, Graham Starsage, Eric Hollett, Greg Watson, Steve Acciaroli), Ocean Dynamics Canada  (Ralph North, Josh Chernov, Mike Dennis), Norwespac Industries (Jim Kyllonen, Josh Monufret), the Bamfield Marine Sciences Centre  (Siobhan Gray, Dane Stable), Diversity Consulting (provided the Falcon ROV), Justin Napier, Alice Bui, Martin Scherwath and Jonathan Zand for their help with installation work. Thanks also to Jonathon Miller, Maia Hoeberechts, Mike Beard, Reece Hasanen, Ian Kulin, Kim Wallace, Clio Bonnett, Ryan Key and the Highland Technologies team for their tremendous help with platform preparation and integration.